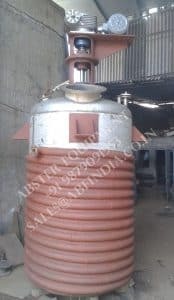 Limpet coil reactor vessels are used to control the temperature of the reactants with the help of heating or cooling media circulated through coils surrounding the main vessel. Ideally suitable for medium heat transfer requirement and heating application where heating media temperature is above 150 Centigrade (302 Fahrenheit). Coils are half piped welded on the outer side of the main vessel.